Sensory Seating - Why is there a wobble cushion in my classroom? 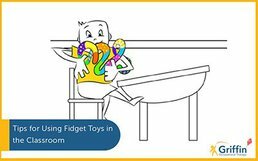 Occupational therapists sometimes suggest sensory seating for children who are constantly fidgeting in their seat. There is a wide variety of different types of alternate seating on the market these days. Wobble cushions, also called sensory cushions, or movement cushions, are frequently available in schools. Sometimes there are wobble stools, ball chairs or one-legged chairs. More recently there are sensory chairs that are designed to rock! In this post, I hope to help you understand why you might choose different seating types and also which seating you could try. Which children may benefit from sensory seating? Sensory seats are designed to help the children who constantly fidget when seated in the classroom. Children that move about in their seats are typically called ‘sensory seekers’ in the sensory literature. Often these children are looking for more vestibular sensory input. Vestibular sensory input refers to our balance and movement sense (this post gives an explanation if you’re new to the term). This sense is not only responsible for our balance, but also helps us to stay alert and focused. Some children need more vestibular input, or movement, to keep attending than others. Occupational therapists often suggest sensory seating for these children. 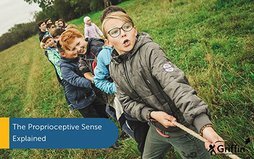 In some cases the child may need extra sensory information from their proprioceptive sense. Proprioception refers to our body awareness (you can learn more about it here if you’re new to the term). For children (and adults) with poor proprioceptive awareness, movement helps them to ‘know’ where their body is. What might these children look like? 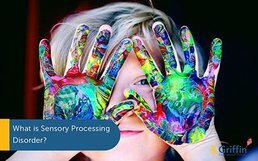 What is the aim of sensory seating? The ultimate aim of all sensory chairs and cushions is to help children (or adults) with their attention for focus. It is thought that children who move about are doing this to help keep themselves regulated and/or alert. Some children might move in order to help themselves to focus. Others may move because it helps keep their body and/or thinking more organised. The idea of any sensory chair or movement cushion is that it helps these children to get the extra movement they are ‘seeking’ whilst sitting in a classroom. The idea is that the motion of the sensory movement cushion (or sensory chair) decreases other distracting or unsafe movements that the child may be doing to help keep themselves alert and focused. The purpose of having sensory seating is to allow these children to move about in a more appropriate way. So, rather than rocking on their chair or moving about the classroom, the sensory seating or cushion gives the child a way to move about in their seat. When could it be used at home? What are the benefits of the different types of sensory seating? The different types of sensory cushions and sensory chairs are designed to give these children movement opportunities that are safer and less distracting, in comparison to what they might be seeking already. There are a few different types. We will discuss the pros and cons of each below. Air-filled or wobble cushions provide a little bit of constant movement when the child is seated in their chair. These sensory cushions are an easy option to implement in a school. They are usually inexpensive and easy to obtain. They are also small and take up very little space. There are a few drawbacks though and we discuss them further in this post – Ten Tips for Using Wobble Cushions in the Classroom for 2019. One legged stools, sensory stools and ball chairs are more difficult and more expensive to obtain. All of these products work by creating an unstable surface for the child to sit on. Because they are unstable and the child has to constantly move in order to stay seated, one draw back of these is they can become quite tiring. I recommend that, if a child is using this type of sensory seating, that they also have access to a regular chair. If the child sits on this seating all day, they can become quite tired. A disadvantage of these seats are the additional space that they take up in the classroom. They can be a better option than sensory cushions though, as they provide more movement overall. Sensory chairs and sensory seats actually move when they are sat on. The newer products on the market, e.g. Zuma Rocker, actually rock when you sit in them. These rock in a safe way, which ensures the child (or adult) does not fall backwards. There is a variety of sensory chairs on the market these days. Most are quite expensive. They will also take up the space of a regular chair, however, unlike the ball chairs and stools, a child can usually sit in one all day, so an alternative chair is not necessary. 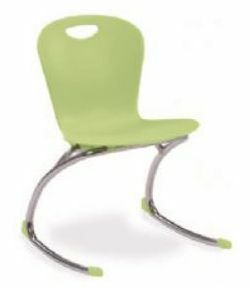 It is highly recommended sensory chairs are tried before purchase. Often the companies have their products available to try at trade shows (e.g. Kidz South/North, Autism Show in the UK). If you have a good relationship with the company representative they may also facilitate an onsite trial at your school. Check to see if the child actually prefers the sensory seating over a regular chair! Our final tip for sensory seating is – monitor, monitor, monitor! Is the sensory seating helping to improve the child’s focus in lessons? Is the child following instructions more accurately? Does the child answer more questions during lessons? Is the child being less disruptive to their classmates and the lesson when seated on sensory seating? 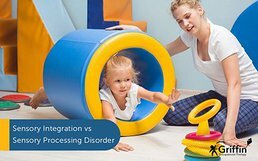 Does the child stay in their seat longer/more often when on the sensory seating? Does the child interrupt their peers less when on the alternate seating? Are they more engaged in lessons overall? Just a reminder if you haven’t read our post on wobble cushions, as you’re interested in sensory seating, you will likely find it helpful. Also, don’t forget to share this post on social media if you learnt something new and join our mailing list to stay up to date with our news.